What is the best way to create a Competency Based Learning (“CBL”) program in higher education? I suggest thinking in terms of a series of tasks – projects, experiences, and assessments – defined by learning outcomes, expressed in skills and related competencies and the underlying methods and applications of the skills. (Make the definition part is similar to Common Core.) Once a student demonstrates or proves a competency with a task, they move on to the next task. And when they have completed a series of tasks they get the credential. But, according to a survey of students taking the CLA+ before college and two years into college, there is no significant gain in critical thinking, complex reasoning, or writing skills for at least 45 percent of students (Academically Adrift). Therefore, I propose getting deeper in the way we think about teaching and learning skills (like critical thinking) in higher education. Let’s consider tracking how students are learning the methods behind the skills. One platform I have been proposing is using a suite of apps: Skill Label™, Skill Syllabi℠, and Skills Based Approach℠; this is something I discussed in a previous article. I would like to get a step deeper with assigning and distributing projects with a Skills Label. Skills Label™ is a patent pending utility to display what is learned in any experience, activity, resources – any discrete task. This utility is used to define learning expectations for traditional media (classroom exercises, books, papers, etc.) with new emerging media (game, virtual reality, IoT, etc.). There is one standardized display. Students have choices and a basis for comparisons. Skills Label™ is ideal way to represent the tasking required in a CBL program. Skills Label™ supports experiential, project based learning. The tasking with Skills Label™ works with team based projects and classroom exercises too. In addition, students may supplement their learning outside of the classroom – self guided learning. A student can go online to compare skills labels representing education resources and choosing one based on: cost or return on investment (ROI), how much time it takes to consume, learning preferences (like a type: book versus a game), or credential earned upon completion. 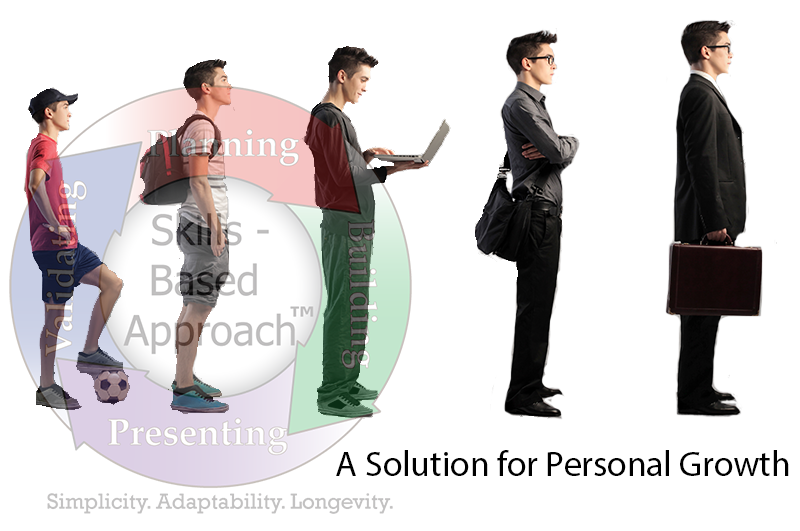 Skills Label™ differs from what currently exists. There is not a process for game designers, educational publishers, providers of online learning platform, practitioners of traditional high school and college programs, and other producers of educational experiences to publish the learning expectations of their resources. Skills Label™ is the standardized display for an educational resource.